When it comes to probiotic-rich foods, yogurt gets all the fanfare but sauerkraut with live cultures contains a wider variety of probiotic strains, and arguably more health benefits. But why choose when you can enjoy both foods? Sadly the art of making homemade sauerkraut has dwindled over the years. Most people wrongly assume that it takes a lot of work and is difficult to make but it actually requires minimal effort and is quite simple once you get used to it. The following recipe is for making a “plain” sauerkraut without the many possible flavor additions. It is delicious on its own but feel free to add a handful of flavor additions, including: caraway seeds, fennel seeds, coriander seeds, juniper berries, fresh basil, fresh or dried rosemary, mustard seeds, or others. Use your imagination if you want to try different flavors of sauerkraut but feel free to also enjoy this simple sauerkraut recipe “as is” because it has a great flavor all on its own. The description below may seem intensive but once you get used to the basic process, it’s actually simple. The technique to make probiotic-rich vegetable dishes usually involves brining. Brining is a process in which vegetables are fermented in a salt-water solution. Brine is simply the salt-water solution. The salt draws water out of the cabbage and helps protect the vegetables from microorganisms that decompose food. Many probiotic bacteria still grow in the salt solution, however, if excessive amounts of salt is used then no microorganisms can survive and fermentation won’t take place. You can use a variety of fermentation vessels, ranging from small to large stoneware crocks, ceramic or glass bowls to wide-mouthed mason jars. Avoid using metal or plastic containers as the level of acidity will increase which can cause a chemical reaction with the metal or plastic. Additionally, most beneficial microbes do not grow well in a metal container so they are best avoided. Glass, ceramic, or stoneware are best. Whatever type you use, you’ll need a plate, jar, or cover that fits inside the crock, bowl, or jar. The reason for this is simple: it helps submerge the vegetables that would otherwise float to the top and potentially spoil. For the cover, I use a plate as large as I can find. Flea markets and antique shops are great places to find both crocks and plates of different sizes to fit. Then, you’ll need a weight. I sometimes use a bowl filled with extra salt water to sit on top of the plate but you can also use a rock that has been scrubbed and boiled for at least 15 minutes. A one-gallon glass jug tends to be a great weight for larger crocks and mason jars filled with water make good weights for smaller crocks or bowls. Don’t panic if you open your crock after a couple of weeks to find a disgusting mold growing on top. It can be scooped off the surface and provided it has not penetrated deeper within the crock will still result in a perfectly good sauerkraut. 1 quart (1 Liter) of filtered water (It’s best not to use chlorinated water since the chlorine can interfere with the natural fermentation process that is required to turn cabbage into sauerkraut). Using a wooden spoon or your clean fist, punch down the cabbage and apple mixture to make it more compact and to release the juices. In a large, clean crock or large bowl place the green cabbage, pushing down with your fist or a wooden spoon to release the juices as you go. In a pitcher or large measuring cup dissolve the sea salt in the water, stirring if necessary to encourage the salt to dissolve. Pour over the cabbage in the crock until the ingredients are submerged, leaving a couple of inches of room at the top for the ingredients to expand. Place a plate that fits inside the crock over the cabbage-water mixture and then weigh it down with food-safe weights or a bowl or jar of water until the vegetables are submerged under the water-salt brine. Ideally, choose the biggest plate possible to fit inside the crock and provide the greatest amount of surface coverage to prevent cabbage pieces from floating to the top of the crock. Cover with a lid or cloth. Allow it ferment for at least two weeks, checking periodically to ensure that the cabbage mixture is still submerged below the salt-water brine. After two weeks the sauerkraut is still fairly crunchy. If you like a more traditional sauerkraut allow it to ferment longer than that. If any mold forms on the surface of the crock, simply scoop it out. It will not spoil the sauerkraut unless it gets deeper inside the crock. It may form where the mixture meets the air but not usually deeper inside the crock. After two weeks, or longer if preferred, dish out the sauerkraut into jars or a bowl and place in the fridge, where it will last for at least a few months to a year. DR. MICHELLE SCHOFFRO COOK, PhD, DNM is a celebrity nutritionist and international best-selling and 20-time published book author whose works include: THE CULTURED COOK: Delicious Fermented Foods with Probiotics to Knock Out Inflammation, Boost Gut Health, Lose Weight, and Extend Your Life, 60 Seconds to Slim, The Probiotic Promise, and Boost Your Brain Power in 60 Seconds. Her work has been featured in Woman's World, First for Women, Reader's Digest Best Health, Health, Huffington Post, Reviews.com, WebMD, ThriveGlobal, and Care2.com. Learn more about her work at CulturedCook.com and DrMichelleCook.com. Hi, I'm Dr. Cook, the Cultured Cook. You may already be familiar with my work. 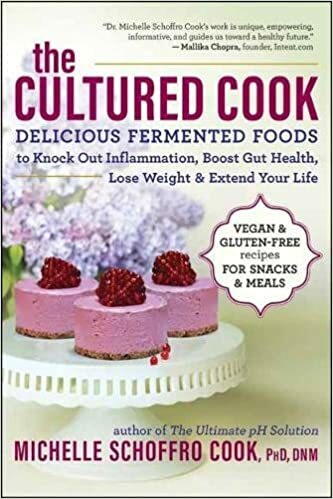 I am an international best-selling and 20-time book author whose works include: THE CULTURED COOK, 60 SECONDS TO SLIM, THE PROBIOTIC PROMISE, THE ULTIMATE PH SOLUTION. I am a food and health blogger on Care2.com, a professional recipe developer, and food photographer. My work and recipes have been featured in Woman's World, First for Women, WebMD, Reader's Digest Best Health, Prevention, Huffington Post, RodaleWellness.com, Care2.com, Closer Weekly, Vegetarian Times, and many other publications. I'm on a mission to help people become healthier through delicious, nutritious food. © All images and text are copyright Michelle Schoffro Cook. Information is presented for educational purposes and should not be construed as diagnostic or prescriptive. If you have any health issues consult your medical doctor. Michelle Schoffro Cook regrets that she cannot respond to all e-mails or inquiries.